Vocativ, an American media and tech company, published a video on October 1 that featured the Chinese delicacy century eggs. The video, which went viral, described them as a tradition and talked about the steps of careful preparation needed to make the century eggs, but referred to them “monstrous”, “smelly and rotten” and “not-so-appetizing”. 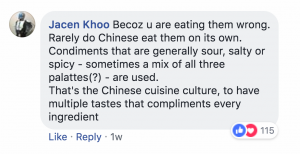 The video received a lot of backlash from Asians, who defended one of their favorite foods and cited ignorance on the part of the American company. 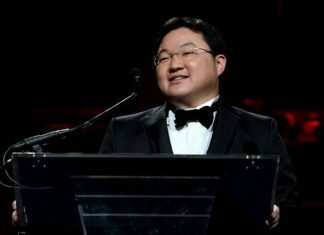 Vocativ has proudly said that their platform “uses intelligent technology, smart journalists and the wisdom of the crowd to find story leads and angles no other news organization can”. 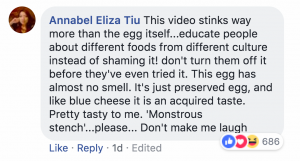 The video in question, titled “The Ghastly-Looking Century Eggs Are A Delicacy in China And A Challenge for Foreigners”, seems to have missed the mark on their intentions, promoting ignorance and bias instead. They tried to put a spotlight on a bit of culture and tradition, which would have been cool, but they seemed to have crossed the line with their choice of words and by including negative reactions of non-Asians trying the century eggs. If Vocativ wanted to focus on promoting culture and tradition, it failed miserably, because the preparation portion of the video took up all of 16 seconds. Most of the video focused on how disgusting and terrible the delicacy is to the American palette, showing clips of several of them retching and spitting out the eggs. Vocativ ruffled many feathers with their controversial ad. Asians were not to happy to see their delicacy described as “ghastly” and “smelly and rotten”. The video also said the eggs give off “a monstrous stench”, have a “murky color” and have a “not-so-appetizing” jelly-like texture. As can be expected, Asians did not react kindly to the video and its rather vivid descriptions of century eggs. Comments range from insulted to sarcastic. But should they calm down? It’s their food after all.